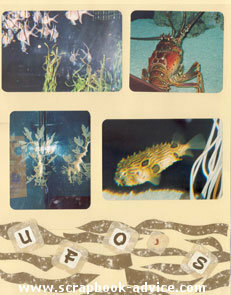 Scrapbook Layout Sketches are a wonderful thing to use to give a boost to your creativity. I used to spend hours on a layout, trying to get it to look just so and then I discovered sketches. Just because I use a sketch that belongs to someone else doesn’t mean that the layout is not mine. It just speeds me up and provides me with finished pages that are pleasing to the eye and look more professional with a good solid design. Scrapbook Layout Sketches allow me to be creative with the smaller details of a layout - like the embellishments, the title & journaling, or creative cropping of the photos. 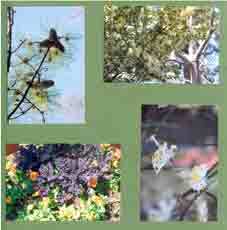 This is a great e-book which has 7 Scrapbook Sketches, each used 3 ways. The book starts with a sketch for 1 photo, then 2, then 3, and so on up to 7 photos. The book then uses design principles that will help you adapt any sketch to the number of photos you have, to a different size (8½ x 11 or 12 x 12) or orientation (landscape or portrait), or from a single page to a two-page spread. 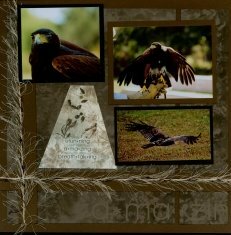 These principles will work on any Scrapbook Layout Sketches you may have. 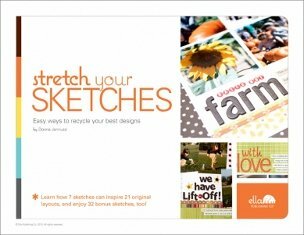 Since Ella Publishing has only e-books at an extremely modest price, check them out here at Stretch Your Sketches. I am sure you will be quite pleased. 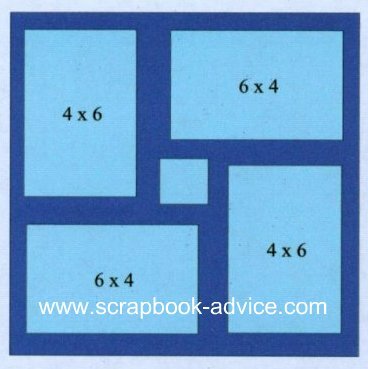 I first heard about Scrapbook Layout Sketches by Becky Higgins back in 1996 through the Creating Keepsakes Magazine. Later I learned about and purchased her sketch book My Creative Companion: The Ultimate Scrapbooking Resource that showed nice professional layout designs that were basic and allowed me to see the basic layout structure without the distractions of photos, colors, embellishments or advertisements. To purchase any of Becky Higgins Books, see our store at the bottom of this page. Her Scrapbook Layouts Sketches are organized by number of photos on a page and the orientation of those photos. 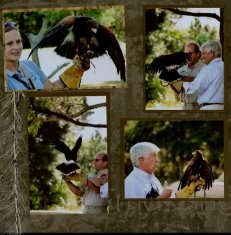 So, if I had 3 photos to go on a page, 2 horizontal and 1 vertical, I could look for that combination. 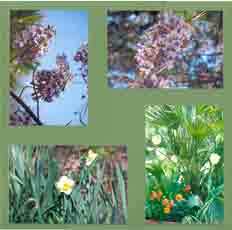 And, if I found something I liked, it could always be turned on it’s side, to accommodate 2 vertical photos and 1 horizontal photo - or turned upside, even. 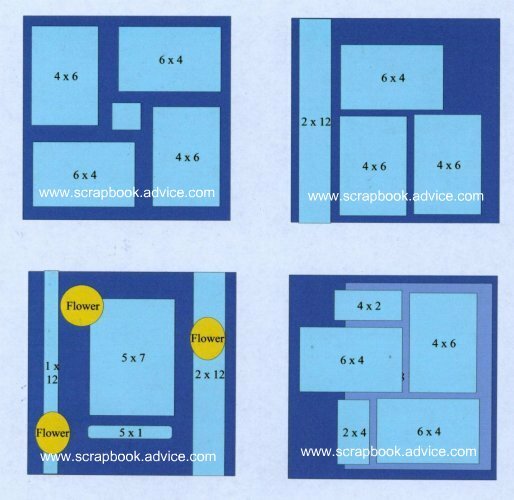 I have been a member of and purchasing Club Scrap kits since 2002 and with each Monthly Kit, they provide a Layout Recipe Card with a couple of sketches, a list of paper sizes needed, and cutting and placement diagrams. 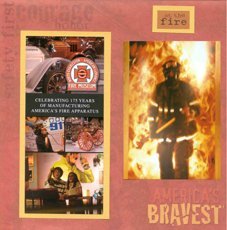 Later, in 2006, Club Scrap started with ALSB, Assembly Line Scrapbooking, where they provided kit purchasers with Scrapbook Layout Sketches along with Cutting and Layout diagrams to scrap an entire kit using all the goodies in the kits and end up with 14 layouts from their Sr. Kit and 8 layouts from their Jr. Kit. Club Scrap helped me to get away from tired layouts that had no originality, and once my layouts were finished from the ALSB diagrams, my photos miraculously found themselves scrapped within minutes. I did my entire Alaska's Northern Lights Scrapbook, 22 pages, in about 30 minutes! Complete with journaling and embellishments - leaving me enough spare time to actually make the scrapbook itself (from the same papers) and design the cover page. Check out my Northern Lights Alaska Scrapbook. Most recently I have heard about Jeanette Lynton and her Scrapbook Layout Sketch book - Cherish: Scrapbook Layouts Made Beautifully Simple. 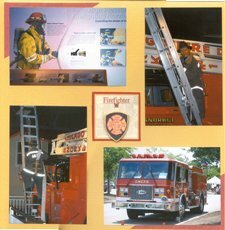 This new book of hers focuses on the two-page layout principle with 3 to 15 photos, detailed cutting diagrams and dimensions, and step by step instructions for assembling the layouts. Two other recently published books Imagine: Fun, Fabulous Layouts for Every Scrapbooker and Reflections: Scrapbook Program are getting very nice reviews for Scrapbook Layout Sketch books. Her book is available at our store at the bottom of this page. 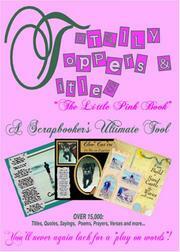 Several years ago I purchased a neat little pink book by Cheryl Bradbury called Totally Toppers & Titles with 10,000 scrapbook titles, 4000 quotes, 1300 poems and more! This has been great inspiration for page titles and journaling and several times the titles dictated the photos that I took just so I could use some really creative titles and quotes in my layouts. Now she has come out with Scrapper’s Soup: Titles and Toppers with 22,000 title suggestions, many of which are plays on words. While I don’t yet have this book, the reviews are great and it will be one of my next purchases, based on how much I have used her first book. See our store at the end of this page to make your selections. Here is one of my own sketches. I am using my own so as not to violate any copy write laws from the above resources. I am certainly not a graphics or layout designer, but I am using this particular sketch just to show you the principle of using a sketch and that it can be used for any theme or color of layout. I guess if I had to give this sketch a name it would be a basic "Pinwheel". The dark blue background is 12 x 12. 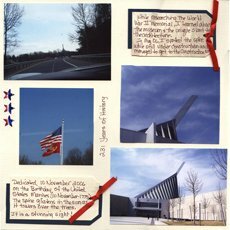 The photos in light blue are 4 x 6 inches, 2 vertical and 2 horizontal. There is a light blue center embellishment or small photo of 2 x 2 inches. Here both layouts are exactly the same, just the photos are different. The center embellishment is left out - there is no journaling. Here both layouts are done from the 12 x 12 sketch, but are actually 12 x 15 inch layouts. 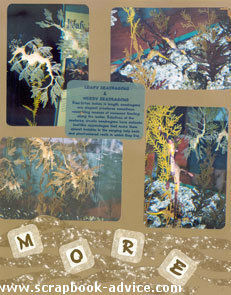 The top portion is a repeat of the Sketch, while the bottom portion is embellished with water and sand images and lettering squares for journaling. The layout on the left uses a journaling block for the center 2 x 2, but it's larger than the one shown in the sketch. Here only the left layouts is done from the 12 x 12 sketch and matched up with a layout from a different sketch. The layout on the left has no center block, but does have the eyelash fiber down the left side and the layout on the right also has the eyelash fiber. 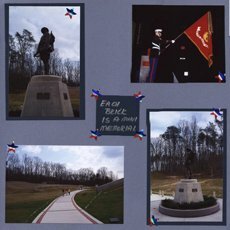 The layout on the left follows the photo and center embellishment placement, but also uses 2 red paper corners. One last set of Scrapbook Layouts from Sketches done from the 12 x 12 sketch above. The layout on the left follows the photo and center embellishment placement, but adds 2 photo mattes and some star embellishments. The layout on the right follows another sketch. Here are 3 more Free Sketches for you to experiment with. We will post some more in the future. I hope these examples of the using the one Scrapbook Layout Sketch can give you some ideas of the varied uses for just one sketch. These are different themes, different colors, different textures, some with embellishments, some without embellishments, and there is certainly lots of room for additions to the main plan. Imagine what you could do with an entire book of sketches with lots of Professional Scrapbook Layout Designs! Below we have a Scrapbook Layout Sketches store where you can purchase the Sketch books mentioned above in addition to some other books and collections of Sketches and Titles. Use the scroll bar at the bottom of the box to scroll to the right and see your Amazon Wish List; search for other products; or see product reviews. All orders go through Amazon's secure order server.